Samsung's smartwatch could be coming September 4th with a dual-core Exynos 4212 SoC. Samsung and Apple already have a fierce rivalry with their smartphones, and that rivalry could now extend to "smart" apparel. Rumors have been plentiful about an Apple smartwatch in the making, but Samsung may beat them to the punch with the upcoming Galaxy Gear. According to multiple sources, Samsung is set to unveil a smartwatch on September 4th, ahead of the IFA trade show in Berlin. 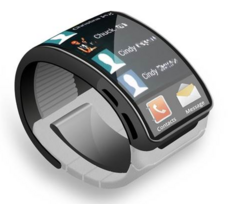 The Galaxy Gear is expected to be capable of answering calls, sending emails and surfing the web and will more than likely run some version of Android OS. Some functions may end up reserved for Samsung smartphones, but it will be interesting to see what privileges extend to other Android devices. As for the watch's actual hardware, sources of SamMobile informed them that the Galaxy Gear will be packing a dual-core Exynos 4212 SoC, along with a 1.67" AMOLED display with a resolution of 320x320. The watch will also have 1GB of RAM, Bluetooth and NFC with a 2MP camera residing on some surface of the device. There is so far no mention of price tag or availability, but all the details should surface soon enough.